Bayern Munich coach Pep Guardiola shows his frustration as his side were held 1-1 at SC Frieburg. 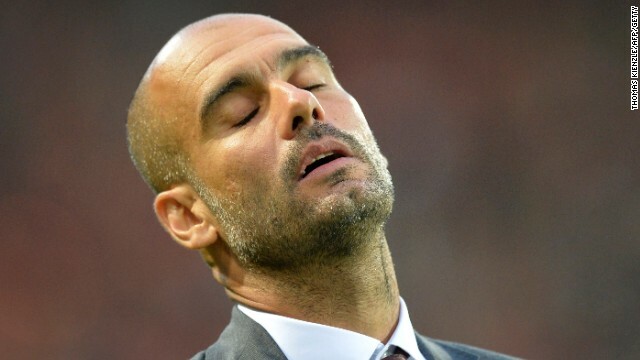 (CNN) -- Bayern Munich dropped their first Bundesliga points of the season under new manager Pep Guardiola Tuesday -- frustrated by a late SC Freiburg equalizer in a 1-1 draw. Guardiola made seven changes ahead of Friday's European Super Cup showdown with Chelsea, but the European champions should have still wrapped up the three points. Xherdan Shaqiri put Bayern in front in the 33rd minute at the Mage-Solar Stadium, but paid the price for failing to add to their advantage when Freiburg substitute Nicolas Hofler leveled with four minutes remaining. It has left the Bundesliga champions with 10 points from four games, a point clear of arch rivals Borussia Dortmund, Bayer Leverkusen and Mainz, who all boast perfect records from three games. Read: Is Real's bid for Gareth Bale distasteful? An unbeaten Bundesliga run of 29 games, dating back to last season was also extended, but there was a worrying development for Guardiola when captain for the night, midfielder Bastian Schweinsteiger, limped off with an ankle injury near the end. It had all looked so promising when German international Thomas Muller completed a superb run by crossing for Swiss star Shaqiri to open the scoring. Muller and Shaqiri both had chances to double the advantage but Freiburg were rewarded for their endeavor when Sebastian Freis crossed for Hoefler to beat Manuel Neuer from close range. Bayern laid siege to the home goal in the dying moments, but could not force the winner. "If you're only 1-0 up in the Bundesliga, things like this can always happen," Guardiola told Bayern's official website. "We have only ourselves to blame," added regular skipper Philipp Lahm, who came on as a second half substitute. Meanwhile, Bayern's Bundesliga rivals Schalke 04 secured their passage to this season's Champions League group stages with a thrilling 3-2 win in Greece over PAOK Thessaloniki. After a 1-1 draw in Germany last week, Schalke's victory secured a 4-3 aggregate win, but they ended the match with 10 men after Jermaine Jones was red carded just after the hour mark. The score stood at 1-1 at the time, but Schalke pulled ahead for the second time when Julian Draxler scored in the 79th minute, a crucial second away goal. Konstantinos Katsouranis leveled for the home side, but Adam Szalai, with his second of the match, sealed a famous victory. In their qualifying action, Arsenal wrapped up their place in the competition proper for the 17th straight time as two Aaron Ramsey goals saw them beat Fenerbahce 2-0 at the Emirates Stadium. The English Premier League side had won the away leg in Turkey 3-0 but still fielded a strong side for the return leg, with Welsh international Ramsey again outstanding. Steaua Bucharest, Austria Vienna and FC Basel will also go into Thursday's draw.